It’s safe to say that exposure to the Winter holidays is inescapable. Lights are hung, cheer is in the air, and opportune moments exist for capturing a great image. This year I challenged myself to capture a creatively themed holiday image unlike any I have seen or taken. For myself, the ritual of a Christmas tree comes along with the celebration. Each year the tree is dug out, erected, and decorated. 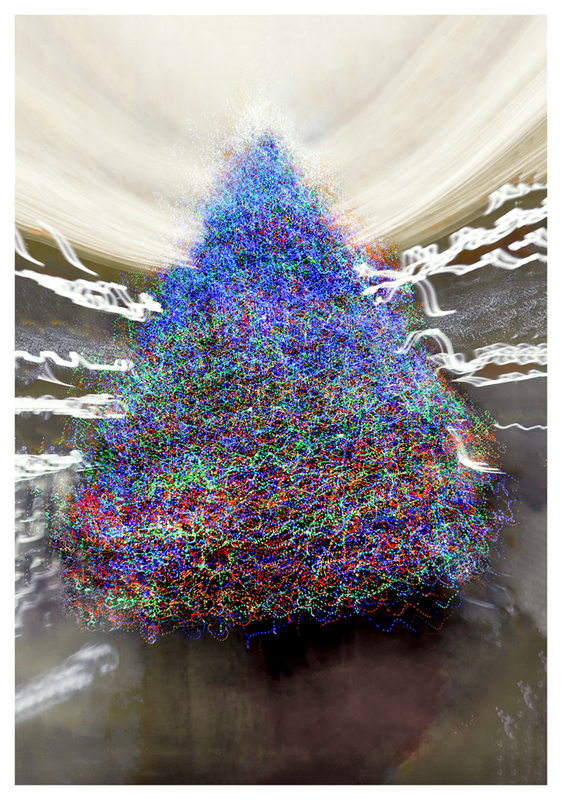 Back in 2007 I took my first creative Holiday images with my first digital camera, a Canon Rebel XT. It was a long exposure intended to make the tree appear as if it were on fire (Figure 1. O’ Tannenbaum). It not only captured a ritualistic holiday family tone, but a sense of mystery and darkness. Around this time I had first seen and been inspired from David Lynch’s film “Blue Velvet” and Otto Muhl’s experimental short film “O Tannenbaum”, to which I appropriated the name. 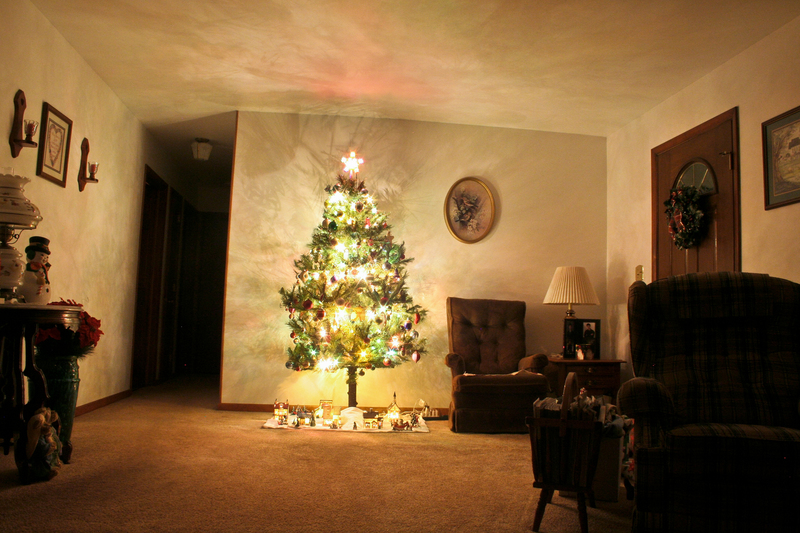 Other inspiration for the image came from photographer Diane Arbus “Xmas Tree in a Living Room” below (Figure 2). Figure 2. Xmas Tree in a Living Room, Diane Arbus, 1963. Here is the image I’ve come up with for the challenge (Figure 3). The editing isn’t 100% as I still need to tweak the color and make the image pop, but for what it is, I feel it accomplished the goal. Creating the image started with experimenting with a wide lens (16mm). After a few shots I noticed the sides of the tree wrapped around the back, and the center bowed forward due to the distortion of the lens. Using this to my advantage, I made a long exposure. Here’s the real kicker; while the shutter was open (8 -10 seconds) I walked a 360 degree circle around the tree equal distance to it’s front, until the exposure stopped. Because the composition of the tree and distance never changed, the shape of the tree remained the same. The result is a 3D representation of a 3D object on a 2D medium. The inclusion of the ceiling in the frame tells the process of how the image was created, melting into a smooth circle on the top of the image. So there you have it, I’ve accomplished my goal and I have to say that experimenting creatively feels great! It opens up the creative juices that only enhance other work. I hope this is an inspiration to go out and capture your own creative holiday images. Keep those shutters clicking! The seed library is a new addition to the Marywood University Library, and supplies members of the community with free seeds for planting. Learn how the seed library operates, as well as more information about the community garden. 1:1 Ratio Photos – Should You Switch? Lately, I’ve been switching from a 4:3 ratio to a 1:1 ratio while shooting photographs. Nostalgia pours in as I think back to this time of the year during early days shooting on film. Leaves falling, days growing shorter, and myself alternating between 35mm and 120 film (a 1:1 ratio). Mentally, shooting on 1:1 is very refreshing and brings me back to a time when the instantaneous results of digital was not present, and composing a shot in my mind was not as fast. My memory recalls paying more attend towards changing light of compositions and limiting shots by how much film was left in the camera. Shooting on a 1:1 format has made me rethink the entire process of capturing an image. The rule of third has changed to quadrants; geometric patterns have also become much more evident. When I hold up my camera I find myself thinking, “Why am I taking this photo and what has drawn me towards this?” I would recommend switching formats to anyone seeking to rekindle their lost creative spark, ambition, or sense of adventure of just going out and shooting. Even if you never show or use any of the images, just shoot. Shoot, and your potential creativity will thank you later. Recent shots I’ve taken at a 1:1 ratio. The Russello Project is hands down, one of the most talented instrumental rock band I’ve come across. I had the opportunity to document their performance with Ken Jones Imagery, at The Factory Underground, located in Wilkes-Barre PA. Ken Jones Imagery and I are also collaborating on a live DVD/Blu Ray for the Russello Project, and are currently at the post-production stage. View More Images (scroll down after clicking). Marywood University is fostering gardening with the addition of a Seed Library to accompany their community garden. I have been given the opportunity to create a short video on used of the Seed Library, and should have the production completed soon.